Did you have one of these dolls for your car? I remember an early CGI version of one of those things appearing in a mid-90s car commercial, can't remember for the life of me what company it advertised. Never had a garfield one, but does anyone remember those plastic hands on a metal strip, that would wave back & forth & had messages printed on them? When I lived in Nova Scotia in the 80's and early 90's I used to see them on cars all the time. I never had one but my grandpa on my dad's side made me a ceramic Garfield one year for my birthday. i had one where Garfield was mooning. i rocked that in my window in high school. i drove a bug and he didn't fit in the back window to well. so i had him in the driver side quarter window. ended up taking him out because i got tired of the huge blind spot he created. I remember having one of those. Wasn't old enough to have a car, so I just stuck it to the windows in the house. I never had that Garfield one. But I do remember the time when 35% of car owners did. I did have a Dominos Noid one though. But that was before I was old enough to even drive. 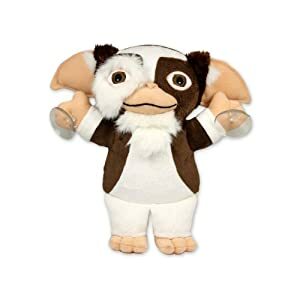 I JUST saw a Gizmo one at FYE last night. They wanted $15 for it. We still have two Garfields in the basement with my Alf hand puppets. It looks somewhat similar to the Gizmo in the Gremlins movie. Wasn't there also a Bill the Cat one? I didn't have one of the sticky dolls, but I always really wanted one of the sleeping Garfield phones. Boy, you run the account statements on your house huh?! Nah I was too young to drive when they were around. By the time I was finally old enough to get a car they were gone.